Red-tip photinia is a shrub that is commonly grown as a hedge. It is fast-growing, evergreen and provides a dense screen. In its youth, the leaves of this photinia are bright red, turning to a dark green as it matures. This shrub is drought-tolerant, will survive in almost any soil and thrives in the heat. Because it belongs to the rose family, however, it is susceptible to many of the same pests and diseases as the rose. Red-tip photinia is hardy to USDA zones 7 to 10. Plant your red-tip photinia in full sun. If you are growing them as hedging, plant them 4 to 6 feet apart. Water established plants only when there has been a lack of rainfall or the weather is particularly hot and dry. Apply water only to the soil as water on the leaves can cause fungus to form. Fertilize the red-tip photinia in the spring with an acid fertilizer such as Miracid or Peter’s 20-20-20 at the rate recommended on the label. Prune shoots when they reach 1 foot long, by cutting them back to 6 inches. In the fall, prune out some of the interior branches to allow the air to circulate within the shrub. Water immediately after pruning. Inspect the leaves for bright red spots. 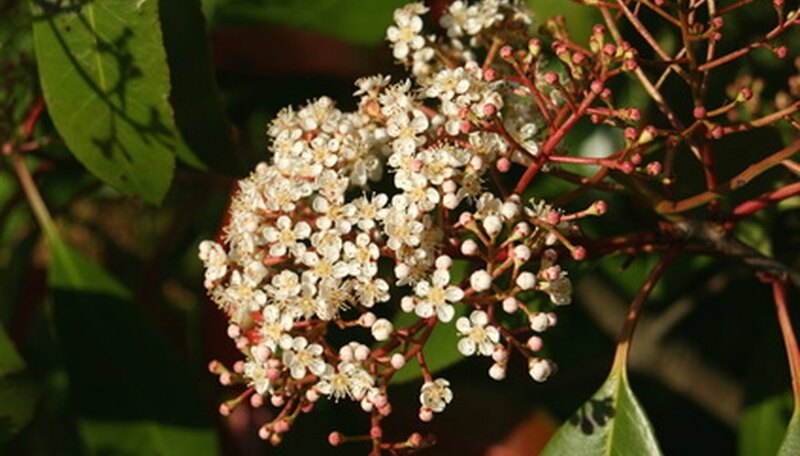 Red-tipped photinia is subject to leaf spot, a disease caused by Entomosporium, a fungus. Heavily infected shrubs should be removed. There are several fungicides recommended for the treatment of leaf spot, among them Banner and Funginex EC. If you have any questions about fungicides or their use, consult with your county cooperative extension agent.